SXSW 2015: Is Austin Getting Too Weird? 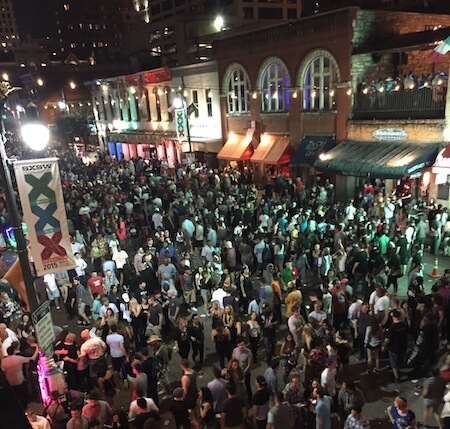 Home » News » Over The Edge » SXSW 2015: Is Austin Getting Too Weird? This was the least impressive, least satisfying year I’ve attended the South By Southwest (SXSW) Music Festival, held last month in Austin, Texas. The event, which began as a sleepy gathering of unsigned bands in 1987 and has since ballooned to become the largest music industry confab in the United States is beginning to lose significance for bands, labels and music-goers. This is the first year I can remember where at least one mega-star did not make a stage appearance at SXSW. No Kanye. No Springsteen. No Metallica. No Prince. Even the larger indie stars stayed home this year. When up-and-comers like Courtney Barnett and Alvvays are among the biggest attractions, you know the festival has lost some of its luster. I saw fewer bands perform this year at SXSW than any previous year since I began attending in 2009 — this year a total of 19 acts. I typically see twice that many bands in the two-and-a-half days I’m in Austin. It wasn’t from a lack of trying. And each year at SXSW I enjoy at least one “perfect moment” concert experience. Last year it was Mark Kozelek playing in a church. The year before it was Jesus and Mary Chain. A few years back it was Bob Mould and Sugar playing Copper Blue. Another year it was the Big Star tribute in memory of Alex Chilton. I didn’t have a moment that came close to those this year. The best thing to a perfect moment was seeing singer/songwriter Natalie Prass in a half-empty club, an incendiary reunion of legendary post-punk band The Pop Group, a brutal set by up-and-coming punk band Krill at a dingy garage venue and a concert by ordained “next big thing” Courtney Barnett in the SXSW Convention Center. Those, along with the Saddle Creek Records showcase, were the highlights. Despite the crowds — which are seemingly endless — there’s no question SXSW is beginning to implode. Maybe it’s just one more reflection of the changing music industry. More fans than ever now stream their music via Spotify or another online service, while CD and download sales continue to decline. One has to wonder what would motivate a big-name band to play at SXSW if the tech-savvy fans in the crowd are just going to stream their music anyway. If their appearance doesn’t help drive sales, what’s the point? But there’s another element that changed my perception of SXSW this year. I was headed back in an Uber car from a meeting on the east side of Austin when the subject of South By Southwest came up with my driver. It was a Friday, the second to last day of the festival, and the weather had finally taken a turn for the worse — warm spring rain fell in massive black sheets. I mentioned to Mr. Uber Driver, a stocky guy in his late 20s with glasses and a no-nonsense way of telling it like it is, that the late-night crowds along the bacchanal known as 6th Street were more hostile than I’d remembered. The night before on my way back to my hotel at around 1 a.m., I shouldered through the mass of humanity, past large groups of very angry men standing in circles in the middle of the street, looking ready to throw down. I decided to detour to 5th Street and avoid the chaos when I ran straight into a phalanx of Austin police, fully armored, weapons holstered, slowly making their way toward 6th Street. Behind them, a mounted police force of no less than a dozen stood at the ready, poised for action atop their regal steeds. Shades of Ferguson crossed my mind. Very few people on 6th Street those nights had a SXSW lanyard hanging ’round their neck or a neon day-pass wristband. It was a sharp contrast to past SXSW festivals. Sure, there were plenty of revelers back then, but there was no doubt most folks you met along 6th Street were attending a music festival, at least early in the evening. By 2 a.m., 6th Street always has belonged to the drunks, the doped, the challenged. Mr. Uber told the story of a fare he’d picked up earlier that week from the hospital — a guy with a broken nose and two swollen bags of black flesh that hid his eyes. The festival-goer had decided to hang out on Red River, a popular street on the east end of 6th, and wait for the Uber rates to drop when a man walked up and asked him a question. As he tried to answer, a second man sucker punched him, and he was immediately converged upon by a small mob who proceeded to kick and punch him while they took his stuff. It was the guy’s first SXSW, and no doubt his last. This was the first year I felt creeped out on 6th Street at night; the first year I felt uncomfortable, anxious and slightly worried someone might sucker punch me only a few blocks from my hotel. Maybe it’s a symptom of my age; or maybe SXSW is beginning to take an unfortunate turn. Don’t get me wrong, I still had a good time. In fact, it’s hard not to have a good time at SXSW. Maybe the festival has reached a zenith; maybe a little bit of implosion is in order. Maybe there needs to be a refocus on the music. To do so, SXSW organizers will have to reconsider what 6th Street means to the festival, but in a city where the credo is Keep Austin Weird, that will never happen.